Woodville’s Charge of the Light Brigade (courtesy of Wikipedia), another famous exercise in futility. This week I have been thinking about digital identity as a process, an insight that emerged from a serendipitous overlap between an email conversation with a friend and the the week’s readings for the UMW Domain of One’s Own Faculty Initiative. This friend and I were trading examples of hilariously old-fashioned faculty websites that we had come across, which I won’t link to, in order to avoid embarrassment for everyone involved. These websites were all probably a decade old, written with hand-coded html and hosted on obviously forgotten departmental or university servers. These sites had a number of things in common–haphazard organization, a weird mixture of personal and professional information, eyeball-searing graphic design, and horrific photography–but mostly, they were incredibly static. They had all clearly been written in a moment of early web enthusiasm, and captured their authors in that moment. For the most part, they looked like they hadn’t been touched since. Whether it was due to waning enthusiasm or the difficulty of maintaining a hand-coded site, these sites were obviously orphans. This email conversation, which was intended to entertain each other at our desks as we work rather than to contemplate the nature of digital identity, popped into relief this weekend as I thought through danah boyd’s advice for controlling your public appearance online. One of her suggestions was to blog because “you can keep updating your identity over time in a way that shows that you think. It’s much easier to get a sense of someone through their commentary on public affairs or life around them than through a static page.” Furthermore, she pointed out that the “best thing about being an active blogger is that stuff gets buried by repetitive blogging.” In a stroke, she pointed out why we found these old websites so laughable: they captured a single moment in their author’s life, which tended not to be a particularly flattering one, coming as it did in their web infancy. Boyd’s advice struck me a incredibly useful: just as our embodied identities aren’t fixed, neither should our digital identities be fixed. And just like we all have embarrassing moments in real life that end up drowned out by our overall track record of being smart, nice, reasonable people, so too can embarrassing online moments get buried by a digital onslaught of our better selves. Smart stuff. Of course, it’s also exhausting stuff. It’s not enough just to put together a website that reflects who we are, we also have to keep expressing who we are so that our digital identities remain up to date and full reflection of who we are. Maintaining a digital identity requires a commitment to daily labor, which seems like a steep hill to climb for scholars whose time and attention is already overcommitted. 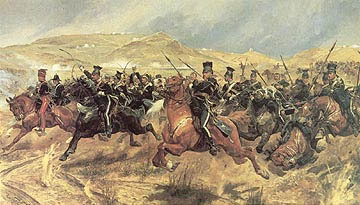 That’s why I chose to illustrate this pose with the Charge of the Light Brigade, which, frankly, was the least problematic of the military metaphors that jumped to mind. It’s interesting how far the tools have come as well. The appearance of those early faculty sites was I think in some small part contributed to by the lack of good tools. We didn’t have WordPress (and even if we did University servers rarely allowed such things) so static was the way to go which set the bar fairly high for the average person. As you point out they might find the gumption to tackle it in a moment but keeping it updated typically proved too difficult and so it became an artifact of that person at that moment in time. I wouldn’t get too caught up in feeling like this has to be a daily labor though. I can speak from personal experience that while I don’t blog daily, I’m on the web regularly in a way that I feel keeps me connected with a larger network of folks online (something we’ll talk more about next week in our cohort). I think it’s a process of moving towards a time where this stuff becomes a regular motion rather than a task on a todo list (and that process moves backwards and forwards as our commitments wax and wane). We’re training ourselves first and foremost to find this stuff important enough to put in the time to do it, then make it a habit, to a point where it becomes second nature.